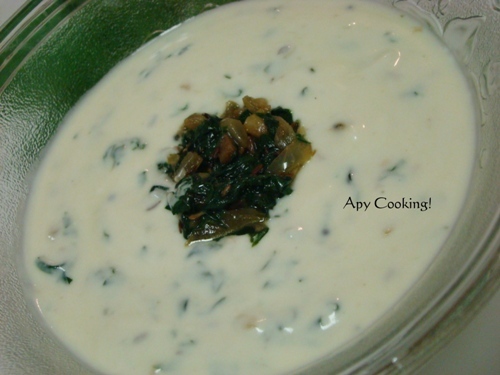 We love palak raita and I make this atleast three to four times a month. I found the recipe of this nutrious raita many years back on the internet and tweaked it a bit to our liking. Heat oil. Add mustard seeds and jeera. 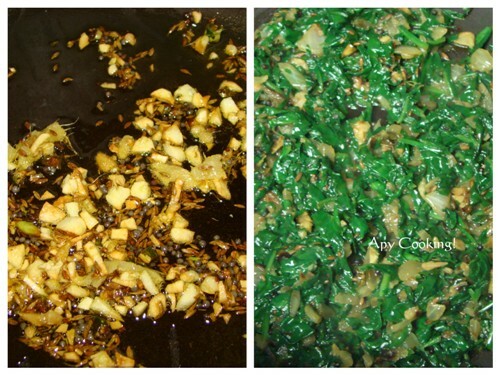 When they splutter, toss in ginger, garlic and green chillies and saute till the chillies and garlic turn brownish. Add onions [I used white onions] and saute for a few minutes, till they turn translucent. Add spinach/ palak [ I used baby spinach, roughly chopped] and salt. Keep stirring (do not cover) for 2 to 4 minutes till the spinach cooks completely. In a bowl, take 1 cup yogurt. Mix with 3 tbsp (or more) of the spinach mixture. Adjust salt accordingly. You can refrigerate the rest of the spinach mixture in an airtight container for later use. Mix with curd just before serving. palak raita looks delicious. I haven't tried curd and Palak look like I need too. wow! nice way of sneaking in spinach esp for kids isnt it ? i hv tried this once with hing and urad dal in seasoning but yours sounds even more delicious with ginger-garlic ..will try . I haven't tried something like this before. I am bookmarking this to try it as I love spinach and yogurt. Delicious raita..never tried this before,the pic is fabulous. Love palak raita, looks fantastic..
Palak raita looks awesome. Very healthy as well. Nice pics. This is very nice Aparna. I will definitely try this. My method is like this. Boil spinach. chop roughly. add raw onion finely chopped, green chilly cut lengthwise. salt n curds. mix well. sprinkle with bhoona jeera powder. this is fantastic ..bet it taste wonderful! 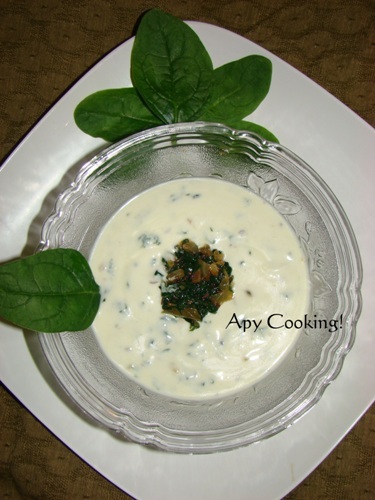 A healthy raita to go as a side dish with any pilaf or curry. 7 Cup Burfi and Celebrating 50th Post!